Want to Play in the Dirt? Get trained at BCORMA's MSF Off-Road Motorcycle School centres. We are happy to announce we are partnering with Popkum Motor Park to offer BCORMA MSF DirtBike School courses in Lower Mainland! Bear Creek Adult & Youth classes start May 4thth. Great Facilities, with camping. Enjoy the weekend. Bring a bike or use a Honda from Penticton Honda. What is BCORMA's MSF DirtBike School New Rider training? The Motorcycle Safety Foundation (MSF) is a US based, not-for-profit organization sponsored by the U.S. manufacturers and distributors of BRP, BMW, Ducati, Harley-Davidson, Honda, Kawasaki, KTM, Piaggio/Vespa, Suzuki, Triumph, Victory and Yamaha motorcycles. BCORMA is Western Canad a's only MSF DirtBike School certified trainer. 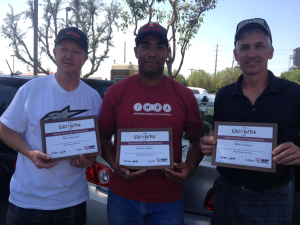 Our MSF Off-Road School Coaches have years of experience and graduated from MSF's extensive trainer course. MSF New Rider training is a practical introduction to off-highway motorcycling for new riders (6 years and up). It is a fun, one-day, hands-on introduction to safe and responsible off-road motorcycle riding. 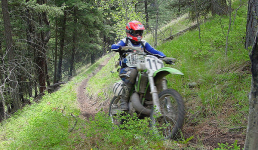 It’s a fun and safe way for youth and adults to get into the great sport of off-road motorcycling. Learn how to properly operate an off-road motorcycle, giving you skills to enjoy BC's incredible trails and vista's. BC has some of the greatest riding in the world. Get the skills to get out there. A small portion of the coaching occurs in a classroom style setting. The majority of time is spent riding within a closed course. What happens at training sessions? Prior to your course, your coach will confirm registration. Days prior to your course a coach may contact you to confirm attendance and answer any questions you may have. Upon your arrival at the course, all riding equipment will be be checked and approved prior to the start of lessons. This check is necessary to ensure that the riding gear you plan on using meets the required standards. Start times are 9:30AM Students are encouraged to be on site 20 minutes before actual start time. The discussion lessons and demonstrations provide discovery and discussion of the principles and practices of riding an off-highway motorcycle. The riding lessons provide riders hands-on practice of riding exercises under the supervision of a Coach. On average, the lessons take about 5 to 8 hours in total to complete. There is no written test. A rider’s knowledge and skills are evaluated and tested throughout the class. Each lesson contains specific objectives and evaluation points. A rider works toward achieving the objective of a lesson by learning and practicing structured activities within DirtBike School. Riders are provided positive reinforcement not only to develop skills but also to recognize and appreciate safe, responsible riding practices. Just posted our MSF DirtBike 2019 May 4th course for early registration to reserve those spots. Courses fill up quick, so watch if want a spot for yourself or as a present! Questions? Call Peter 250-412-3444 BCORMA knows off-road motorcycling!